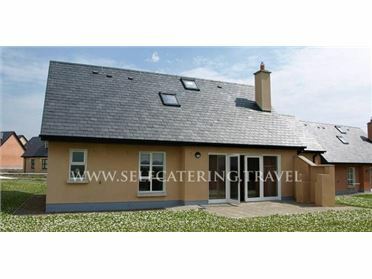 Tara House is a stone-built, detached bungalow situated in the rural townland of Lettermacaward, just seven and a half miles from Dungloe in County Donegal. The cottage sleeps five people in two double bedrooms, one single bedroom and a family bathroom with a separate shower and bath. The accommodation also includes a kitchen with a dining area, plus a sitting room with an open fire. Outside, the cottage has off road parking for four cars and a front lawned garden. With the lively town of Dungloe, many beautiful beaches and the lakes and mountains of the Glenveagh National Park just a short drive away, Tara House is a great base for discovering this glorious part of Ireland. Dungloe has become recognised as a centre for traditional Irish music, has a selection of shops, bars and eateries, and events throughout the year. The area has over 130 lakes and rivers, and is renowned for its fishing and sea angling, with several charter boatsavailable in nearby Burtonport. Oil central heating with open fire. Electric oven, hob and grill, microwave, fridge, freezer, washer/dryer, dishwasher, TV with Freeview, DVD, CD/radio, selection of books, games and DVDs. Fuel, power and starter pack for fire inc. in rent. Bed linen and towels inc. in rent. Cot and highchair on request. Off road parking for 4 cars. Front lawned garden and paved area surrounding property. Sorry, no pets and no smoking. Shop 1 mile, pub 1.5 miles..